While the longest government shutdown in history was estimated to cost the economy $3 billion, our January data shows it has had little to no impact on job openings. Government job openings were flat between December and January, and the Bureau of Labor Statistics, found “no discernible impacts” based on their estimates of employment, hours, and earnings from the establishment survey. We did find searches for part time jobs on LinkUp increased 74% from December through January, and searches for companies such as Uber, Lyft, Shipt, Instacart, and Doordash increased by 194%. The real winner of the shut down may have been these gig employers. We’ll keep watching to see how the shutdown impacts jobs in the long term. If shutting down the government becomes a frequently used political strategy, it will be more difficult to recruit and retain civil servants and contractors, especially millennials already skeptical of public service. We also anticipate it will cause an increase in job duration (the amount of time a job listing stays open). Stay tuned. Most major health clubs and gyms reduced job openings between December and January. Fitness Trainer and Aerobic Instructor positions were down 16% from December. One might assume seasonality, but if anything these jobs tend to increase in January and peak in February each year, so that’s not the case. It could be that gyms are just another business in danger of extinction by the millennial generation (who prefer trendy boutique studios to large corporate fitness enterprises). In what is likely a strategy to grow business and woo millennials, companies such as Life Time Fitness and Equinox started looking beyond treadmills and free weights in 2018, expanding into areas like co-work office space business. In summer 2018, Equinox also started the process of developing hotels in New York, Los Angeles and Chicago, which has already influenced their job openings. In January 2019, hotel-related occupations where among the top 10 job openings for Equinox. This expansion into multiple new businesses may be one reason Equinox is the only national health club chain in the LinkUp Index to increase its job openings between December and January 2019. 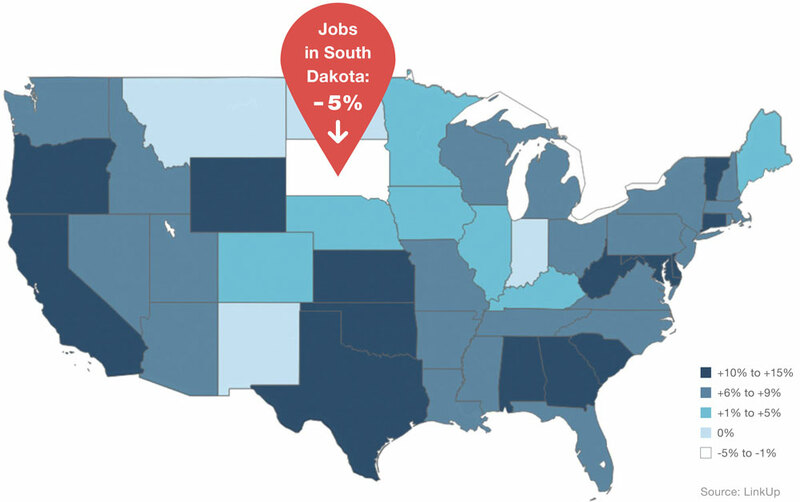 South Dakota had the only decrease in openings in January at -5%. One driver of the decline was the employer Sanford Health, which saw 34% less job listings in January than December. It is unclear what is driving this drop in listings, perhaps it is related to Sanford’s planned merger with the Good Samaritan Society which was completed in January. Which mall-based retailer will file for bankruptcy next. This week Charlotte Russe announced they would close 94 stores in bankruptcy. We continually see steep drops in job listings from retailers prior to a bankruptcy announcement, as we did with Charlotte Russe. In fact, we recently wrote a blog post about Urban Outfitters possibly being the next retailer to file for bankruptcy. Download the data behind this January’s jobs recap. The excel file includes: job openings by sector, job openings by state, job duration by sector, and our non-farm payroll forecast.